1Ege Üniversitesi, Eczacılık Fakültesi, Eczacılık İşletmeciliği Anabilim Dalı, İzmir, Türkiye DOI : 10.12991/mpj.20151966656 Objective: Today, pharmacists" systematic postgraduate training is increasingly gained importance with developments in science, technology and profession. 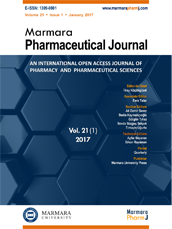 In this study, it is intended to determine TPA Pharmacy Academy education subjects, training methods, prevalence, comprehensiveness and duration. Method: It is a cross-sectional, descriptive study. Population includes trainings conducted in 2009-2013 by TPA Pharmacy Academy. Trainings" subjects, organized provinces, duration, methods, timeline were compiled scanning Academy"s website and TPA 37.-38. Period Study Reports. Data is assessed by frequency and percentage distributions using SPSS18 software package. Findings: It was determined that 275 vocational training programs organized by TPA Pharmacy Academy between 2009- 2013; most training held in 2010 (25,5%) and trainings reached slightly more than one-third(37%) of pharmacist chambers, and 33,8% of pharmacists in Turkey attended trainings. It was determined that main training topics (56,7%) comprised of pharmaceutical care and disease information, there is not any training on pharmaceutical legislation issues, sufficient preliminary work is not done for determining pharmacists" demand in subject choice. It was found that mostly face-to-face teaching methods (58,9%) are applied but web-based interactive trainings, increasingly widespread in the world, never used.